The Preferred Enemy: Chaos Lists! So as I have been thinking about my Thousand Sons lists I also ended up messing around with some other lists just to see what people could put together. 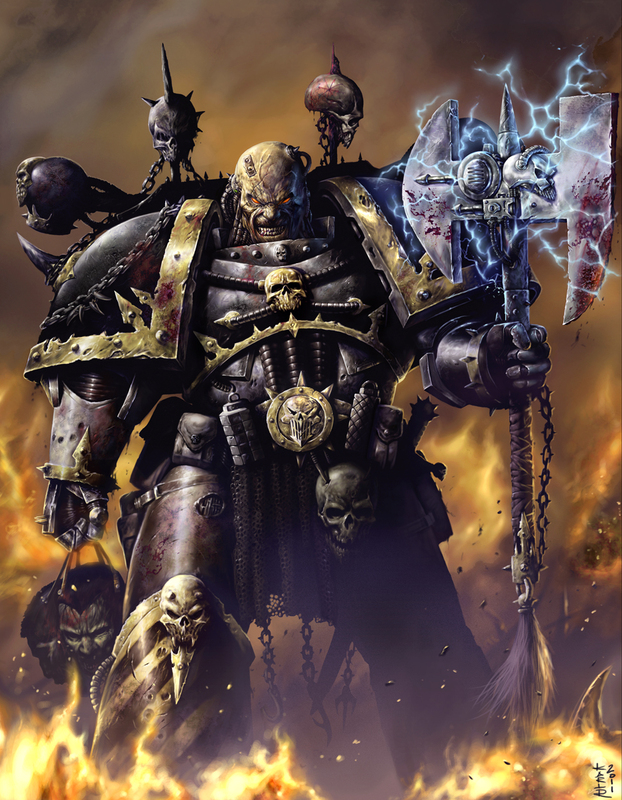 The first thing I thought about when reading this Codex was using all of the new daemon engines to make a super Iron Warriors style army. Is it any good, who knows! But it would be neat to use all these new toys. That's about 50 points short of 2k, so you could have some options to try out. This is mostly a stand back and shoot list so you probably want to mix the forgefiends with the different gun configurations. The Helldrakes just go bale flamer and be aggressive. Cultists go in reserve and your blob of CSMs take the two IC which will be nasty behind the aegis if anybody can make it over to combat with them. I left the Hellbrutes cheap just to have some MM in the army but they could go on the flanks or just function as counter assault units. If they advance they could take heat of the forgefiends at the least. If I didn't have so many armies already this would be the army I'd want to try. The nice part is with magnets you could easily change this army into a CC based army and swap into Maulerfiends and Dual CC Hellbrutes and just start running up the field. Leave the Cultists in the back and have uber blob moving up the field to take a forward objective. I was also talking to Liam about potential Nurgle themed lists. These are always popular and I can see something like this being run if people don't just move straight into Daemon allies shenanagins. 2000 points on the nose. It doesn't look like a lot of scoring but since everything has fearless and FNP it is not easy to dislodge. Plus you have 6 T6 bikers coming at you which is hard to deal with and 6 oblits shooting from afar. 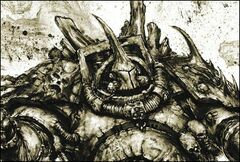 Typhus and his 3 Termies can deep strike, slog, or just stay back with the zombies to counter assault. Can zombies man the Quad gun? They can't take options, but it doesn't say they can't shoot the quad I think. It lacks melta but certainly you could swap that on the bikes first and foremost since the PM are sitting in the back. I am not sure havoc launchers are worth it (or even rhinos) so you could certainly swap those out for more PM bodies if you wanted. How about a super CSM horde list? That's about 1982 in points if my math is right so you could play around with some points there for special weapons on the CSMs. The main point is Fabius can go with the non enhanced Melta unit and two fearless CSM units can be leading the charge across the field. They then get backed up by another 40 marines behind them. That is just crazy scary! 30 Cultists just sit on a rear objective hopefully in the best cover you can get, while the havoc give you your only real range support and are about as anti flier as you can get. The strength of the army is the 80 marines coming across the field at you! Like I said at the top I'm not sure any of these armies are the most competitive. However if I take a look at my current 1ksons list and compare them to these I just don't see any way they can stand up to any of these. Could my bikes deal with any of these? The 2x Helldrakes would be painful when looking at the Iron Warriors list. Maybe the Nurgle list is an even match up for them. But the 100 marines vs 40 Bikes? I'm not sure those odds are good for the bikes... but maybe there's a good game there. How about my Imperial Fists? Against the Iron Warriors it is not only a great fluff battle of arch nemesis it would probably be a great game decide by who had the first good round of shooting. The Nurgle and Horde list I'm less sure about... these might be more mission dependent that anything else. Or course bigger questions might come down to more of the popular builds out there. Can it deal with a Draigo army? Can it deal with Necron Airforce? If any army wants to be able to be an effective tournament build. 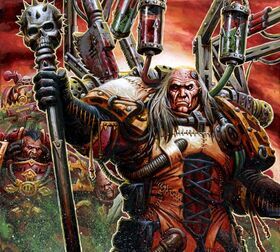 This is where I think the first list probably excels (take ectoplasma cannon forgefiends for paladins and helldrakes to can hopefully mangle the necron airforce). But that's a big investment in models for an unproven army, but it sure would be fun!